As we know, systolic hypertension has emerged as a major problem particularly when one starts aging. Now, let me first begin with what is the definition of systolic hypertension and this I have chosen from the European Society of Cardiology. The isolated systolic hypertension is defined as, when the systolic pressure is above 140 and the diastolic pressure is less than 90, it is called as grade I systolic hypertension and grade II when the systolic pressure is above 160 and the diastolic below 90. Let me begin with a little bit of data from our Country and this is a very nicely done urban epidemiological data on hypertension, the CURES-52, which was published in JAPI a few years back, and if we look at the incidence of isolated systolic hypertension, the isolated systolic hypertension above the age of 60 years is very common in our country and the incidence is around 25% and as we know now that the population is aging even we do see a lot of people living up to 80s, lot of people in 70s, so the incidence is going to be much higher when we look at the population in the 7th decade and in the 8th decade. For years, we used to know the diastolic blood pressure is the one which is associated with coronary events, then we started knowing about systolic blood pressure and the association of systolic blood pressure with stroke, but what is important to know is in the recent years there has been emphasis on what is called a pulse pressure and when you look at the pulse pressure, there is a correlation between pulse pressure and the coronary artery disease. In systolic hypertension, this becomes extremely important, because as we know in systolic hypertension, the systolic pressure is elevated, the diastolic pressure is normal, or sometimes even lower which results in the pulse pressure becoming higher and if you look at the pulse pressure, as the pulse pressure keeps on increasing, the CHD hazard ratio keeps increasing. So, with systolic hypertension increasing, the pulse pressure increasing, we can expect more and more coronary artery disease. A little bit of about the pathophysiology of systolic hypertension and when we talk of the pathophysiology of systolic hypertension it becomes important to know about certain points and particularly about the large arteries and the aorta. The most important factor in systolic hypertension relates to arterial stiffness. The other factors which are responsible are autonomic disregulation and the role of renal function and cation imbalance, the role of sodium and potassium. These have been some of the mechanisms in systolic hypertension which we have known and as there is aging, there are lot of changes, which start happening into the vessel wall. There is oxidative stress in the vessel wall. There is inflammation in the vessel wall. Also, factors like hyperglycemia, hyperlipidemia they cause lot of changes which lead to impaired nitrous oxide CMP pathway and there is damage to the endothelium. There is also platelet aggregation and these factors contribute to systolic hypertension. There has been some newer mechanisms which have been talked in the systolic hypertension in the last few years and the role of progenitor cells, the role of chromosomes, telomere shortening, the role of platelets, the endothelial dysfunction so there is a lot of element of endothelial dysfunction, element of platelet aggregation and the element of arterial stiffening which is responsible for systolic hypertension and this is a broader view to explain the systolic hypertension. In systolic hypertension there is arterial stiffening; there is an increase in the pulse wave velocity, which increases the reflector pressure; there is an increase in the impedance to the aorta, the left ventricular afterload increases; there is, what we call as, the left ventricular function, remains preserved, but there is a diastolic dysfunction and these are the changes which occur in patients with systolic hypertension. There is a systolic pressure which is increased, the pulse pressure increases, the diastolic pressure is comparatively on the lower side which reduces the coronary blood flow, can cause myocardial ischemia, increase in the left ventricular wall thickness, increase in left atrial size, left ventricular stiffening and the diastolic dysfunction with preservation of the left ventricular systolic function. So, there is a cycle of changes which can occur in patients with systolic hypertension depending on the duration of the systolic hypertension, whether it has been controlled or it has remained elevated. This is just a short mention about what we have known from the ASCOT trial and from a new noninvasive technique called as applanation tonometry and this was arm of the ASCOT trial, the CAFÉ trial in which we came to know about the difference between what we measure in our day-to-day, the brachial artery pressure or the cuff pressure, and the difference between the cuff pressure and the central aortic pressure. The central aortic pressure or the pulse wave, which is important and there are many drugs which equally reduce the brachial pressure, but we know that the mortality with those drugs do not change and the reason behind that is this particular concept, the knowledge about what is called as a central aortic pressure. There are a lot of end-organ effects, which can occur with systolic hypertension, the cerebrovascular disease and we see patients in 8th or 9th decade the issue of cognitive disorders, as I mentioned the left ventricular hypertrophy, diastolic dysfunction, atrial fibrillation, associated CKD, high incidence of abdominal aneurysms, peripheral arterial disease, changes in the eye and quality of life which can get affected. A very important question and when you will start reading this particular topic, there is no unanimity about who should be called as elderly and if we look at the various societies, European society, American Society, JNC, NICE, ACC, AHA, the definition of elderly is varied and whether above 60 is elderly, above 65 is elderly, and this is a very nice looking categorization by American College of Cardiology and AHA, 65-74 age group they call them as the young old, 75 to 84 called as older old, and above 85 being called as old old. In most of the definitions, now it looks that the definition of elderly is above 65, but even it is a wide range. A person at 65 or a person at 70 can be extremely healthy and there will be a different application of how you treat him as compared to a person who is in his 80s. 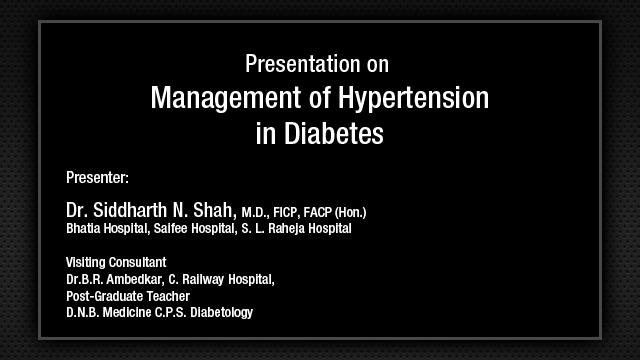 Now, when we look at the untreated hypertension, untreated hypertension is common in all age groups. It is a problem when we see a systolic hypertension, diastolic hypertension, now also the common combined hypertension, but there is a very high incidence of isolated systolic hypertension remaining untreated and as the age advances, if you see the decades between 60 to 70s a large number of patients with isolated systolic hypertension remain untreated and when they become more elderly the incidence of untreated systolic hypertension remains much higher. Having talked about the pathophysiology, just look at what is the impact when we treat the blood pressure and even when we reduce the systolic blood pressure in a very small denominator by 2 mm, 3 mm, 5 mm we are able to have substantial gains in terms of reducing the stroke, in terms of reducing the coronary artery disease, and in terms of reducing the total mortality. So, it is important that we treat the systolic hypertension and we can have very impressive gains in terms of reduction in stroke and in terms of reduction in the coronary artery mortality. Before I come to what drugs we should use, we should not forget that even in the elderly persons, above 65 or above 60, there is a lot of role of weight reduction and there is a role of nonpharmacological measures, and all these measures which we have known, help in better control of the blood pressure. Reduction of the weight has a linear correlation and weight reduction should be emphasized particularly in those elderly hypertensives who are overweight and a sort of modest reduction in the blood pressure can be achieved by weight reduction. All nonpharmacological measures like the restriction of sodium, reduction of alcohol, supplementation of fruits, and the physical activity, they are all important and should be emphasized even in elderly persons with systolic hypertension as we do in all other persons with hypertension. We should not presume that since the person is 60 or 65, we should not advise the nonpharmacological measures for reducing the blood pressure. There are less number of antihypertensive trials. This is a very crowded slide, but this is just listed to show that there has been lot of trials, which have looked at the systolic hypertension and the hypertension in the elderly, the ACCOMPLISH trial, ALLHAT trial, then in the recent years we have heard about an important trial called HYVET which has been the treatment of hypertension in very elderly enrolling the patients in the age range of 80 to 100, the LIFE trial, SHEP trial, STONE hypertension trial, systolic hypertension trial from China, VALUE trial. So, there is a reasonable amount of information which we have of treatment of hypertension in elderly and also about the treatment of systolic hypertension. When we look at all these trials using various agents, one information which we get is that when you treat hypertension, you are able to reduce the events, so treatment is important and how our emphasis, how our methods to treat the hypertension change and if we look at the way the history of antihypertensives have been what we used in 50s, 60s, 70s to year 2010 has kept changing. Here is a very interesting thing which we all have heard in the last one year, hydrochlorothiazide or what we have been calling thiazides have been with us for almost last 50+ years. We have been using thiazides during the last 50 years and now suddenly we have started knowing lot many different things about thiazides, so what Venkat told us all these years now he has started telling us different things. Now, lets talk about the various drugs which are available for treating systolic hypertension as they are available for treating combined hypertension. We have diuretics, we have calcium blockers, we have ACE inhibitors, ARB and we have combination therapy and out of the combination therapy, the combination of calcium blocker with ACE inhibitor, which has been tried in the ACCOMPLISH trials, now there is a sort of question mark about beta-blockers and since there is going to be different talks tomorrow, I will not talk much about it and also there is a question mark about the use of alpha-blockers. Other than that, we can use diuretics, we can use calcium channel blockers, we can use ACE inhibitors or ARB and when necessary, we can use the combination of drugs. The choice of the drug many times gets dictated by the other accompanying diseases which the patient is having. Suppose, you have an elderly who is a diabetic and has also got systolic hypertension with diabetes, I think your choice will fall on ACE inhibitor or ARB. If a person has an associated ischemic heart disease, of course the treatment changes accordingly. Now, a person, where there is an uncomplicated systolic hypertension, you can choose the drug which can be a diuretic, calcium channel blocker, ACE inhibitor or ARB. Now coming a little bit about, All these years, we have used thiazide diuretic as a drug which has been commonly used and I will show you in the next slide about what we now know about chlorthalidone and there has been also a renewed interest particularly with the HYVET trial about the use of indapamide. Usually, the loop diuretics like furosemide, torsemide, we do not use in patients with uncomplicated hypertension. We use in only those patients who have become too much volume overloaded and that also for a short period and the use of potassium sparing diuretics is in only selected patients with hypertension. There has been a lot of new data about the thiazide diuretics and what we have started now in year 2011 is that thiazide diuretics and these are the number of trials 14, 5, 7, 3, in which we have come to know that the thiazide diuretics are less effective as compared to ACE inhibitors, ARB, calcium channel blockers and beta blocker than the other drugs in reducing the systolic and diastolic blood pressure and these are some of the newer studies based on the 24-hour ambulatory blood pressure monitoring and there is a question mark about the use of thiazide diuretics; although, still as we know from the JNC7, the thiazide diuretics were one of the first line drugs and comes this important data or this important paper in JAMA in 2011 which was on the long-term survival of the SHEP trial which told us that the primary outcomes like cardiovascular death, all-cause mortality, the gain in the life expectancy, this improves with chlorthalidone, the drug which we have forgotten during all these years. In fact, when I was a resident in medicine in 1976-77 we used to use that time Hydrotrone, which used to be chlorthalidone. I think Ravi will remember in Jaipur we used use. From this very long 22-year followup data of the SHEP trial between the active treatment and the placebo, the total deaths, cardiovascular deaths, and the all-cause mortality survival from cardiovascular death and this has brought back into the picture that probably the diuretic which we have used should be chlorthalidone rather than thiazide and of course there has been a large number of articles and we have attended many meetings during the last one year. This is by Norman Kaplan in the Hypertension: Chlorothiazide versus Chlorthalidone, A Tail of Tortoise and Hare. It looks like that probably we should use more chlorthalidone than the thiazide diuretics. Now, these are the trials and these trials tell us that most of the times it is not even in the elderly population, most of the times you are not able to control the blood pressure by a single drug and you require in most of the patients more than one drug, and if you look at all these trials, the ACCOMPLISH trial, CONVINCE, INVEST, ALLHAT, HYVET, LIFE, SHEP, STONE, almost two-third of patients have required more than one drug. So, you do require a combination rather than this and this is one of a very important trial in systolic hypertension which has been with a combination of ACE inhibitor and calcium channel blocker versus ACE inhibitor and a diuretic and the diuretic was hydrochlorothiazide and in this trial we came to know that the combination of benazepril, ACE inhibitor, and amlodipine is better in reducing the primary outcomes and the mean blood pressure. As compared to an ACE inhibitor and a diuretic, that is a thiazide diuretic, if you use a combination of benazepril and amlodipine, this combination is better particularly in high risk patients. The American Heart Association and several other association, what should be your target when you start treating patients with systolic hypertension, whether it should be 120/80, 130/80. Majority of the times, the target for treating these cases should be 130/80 except in very elderly patients and if you are dealing with patients who are having diabetes, left ventricular dysfunction in all these 130, otherwise you keep the patient's blood pressure below 140/90. I will make a small mention about what is called as a sort of J-point, what is called as a consideration when you are treating the patients, if the persons diastolic pressure falls below a particular point you can harm the person, if you reduce the blood pressure below 60 to 70 and this is called as a J-curve hypothesis and we should be sort of aware of this particular part in patients. Just a word about a few causes of secondary hypertension in elderly, particularly not to forget about obstructive sleep apnea, renal artery stenosis and in those cases where we are not able to control the blood pressure. My final slide, there are certain aspects which we should keep in my mind beginning from the caution in measurement in these patients. We should measure the blood pressure in all postures, look for associated diseases, look for the side effects and particularly postural hypotension is a problem when we are dealing with elderly systolic hypertension and there should be more frequent clinical and biochemical examination particularly in those where we are giving them diuretics. Question from Chairperson: Thank you very much Dr. Sharma. We have been very much impressed about your talk. We usually treat Hypertension by targeting the central aortic pressure as well, which is the drug which will help more in central aortic pressure, particularly in elderly. Dr. Satyavan Sharma: The drugs which help more in controlling the central aortic pressure again are the same, the calcium channel blockers and the ACE inhibitors, these are the drugs. In fact, the controversy of not reducing the central aortic pressure mainly is about beta blockers and also a bit about the diuretics. So, the calcium channel blockers are very good drug and ACE inhibitors and ARB also reduce the central aortic pressure.